Mr. Adam C. Simpson, Steward of Tarporley Circuit, has all his life been associated with our Tiverton Church, of which he is Society Steward. He has taken his full share of official responsibility, having occupied almost every office. Circuit and District have honoured him with election to Synod and Conference. He gives liberally, is a tireless worker, and regularly attends Sunday and week-evening services, and is highly esteemed through the Circuit. He is aided in his work by a devoted family, Mrs. Simpson, two daughters and four sons being earnest workers. Their home life is marked by a strong missionary enthusiasm, and most of our African missionaries have been cheered as year after year, and for many years, the boxes have been opened containing sums from ten to twenty pounds. Adam was born in 1857 at Tiverton, Cheshire, to parents Charles Frederick and Emma. Charles was a farmer (Tiverton Hall Farm). Adam followed his father as a farmer. 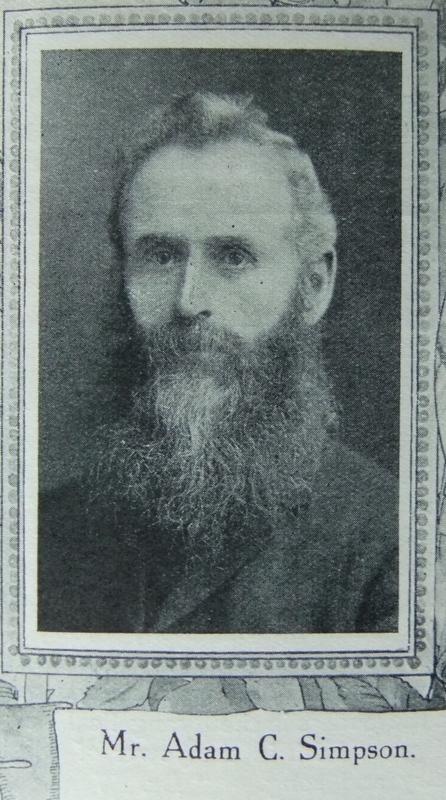 Adam married Frances Aston (1856-1921) in early 1882 at Tiverton, Cheshire. Census returns identify nine of ten children. Adam died on 4 February 1927 at Tiverton Hall, Cheshire.